MEMENTO...an item which serves as a reminder of what is passed or absent. Pet mementos are dichroic glass pendants with a small pinch of your beloved furbaby's ashes or fur fused (melted) into the pendant's heart. Whether your fur baby is deceased, or whether you simply want to celebrate your pet when you're away at work, your pet will always be close to your heart whenever you wear your pet memento. Each memento is created to order by Serendipity by Carol jewelry from a unique blend of dichroic glass pieces fused over your choice of colors…each pendant is as individual as your pet. Glass jewelry is wonderful to wear…it is smooth against the skin and seems weightless as it absorbs the body’s heat and adjusts its temperature to the wearer’s. Dichroic glass is an amazing glass originally developed by NASA that has both a reflected and transmitted colour (hence the name dichroic from the Latin di=two and chroic=colour). 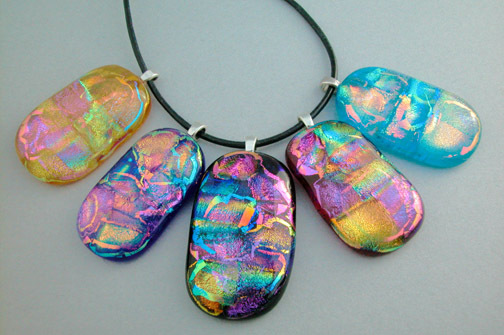 This unique effect is created by a thin layer of metal salts sprayed onto the glass in a vacuum chamber, and it is this duality of light, combined with the colors chosen that gives dichroic glass jewelry an opal-like depth and shine. While fur essentially disappears within the pendant, ashes may appear as a darker inclusion within the pendant, or sometimes they are hidden by the reflective nature of dichroic glass. This is part of the unpredictable alchemy of glass fusing that makes each piece unique. Pet mementos are available in five colors…you can choose aqua, cobalt, gold, cranberry or black. Each pendant comes with a complimentary leather cord, which can be upgraded to a sterling silver chain. Press the shopping button to the left when you are ready to order and you will be transferred to Serendipity by Carol’s shopping cart. HOW DID PET MEMENTOS START? 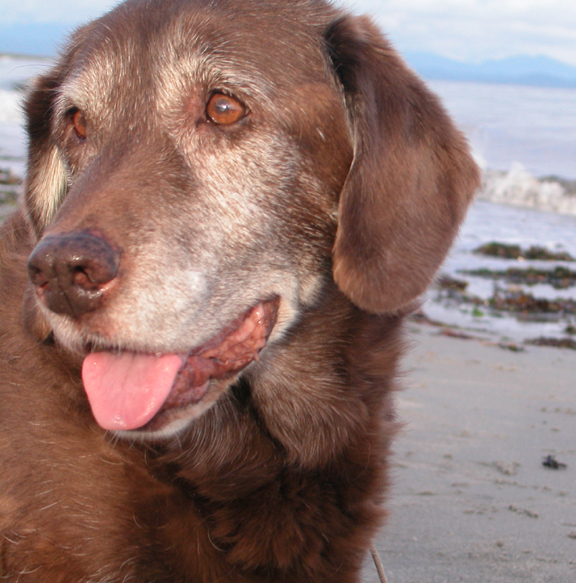 Pet mementos evolved in my life followed the loss of my beloved companion of 15 years, Kayla, a chocolate labrador retriever. I am curious by nature and was working in the studio making a line of fused glass jewelry called ‘Serendipity by Carol’, I wondered if I could put a pinch of Kayla’s ashes into a pendant and then melt/fuse it all together. Technically I realized it was possible because the ashes didn’t contain any organics or moisture, and also experimented with using fur instead of crematory ashes. Experimenting and making the first memento was a way of keeping KAYLA always close to my heart and helped me heal from my loss. It gave me great peace to wear this memento and I wanted to share this peace with others…hence pet mementos were born!!! Today, my cat Velcro lovingly brings her energy to each pendant I respectfully create honouring the relationship and bond between you and your pet. 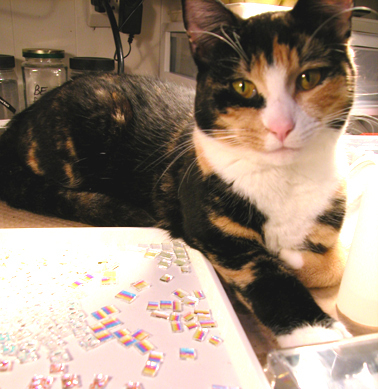 She’s fascinated by the sparkly glass and often sits on the workbench when I am making pet mementos. She’s the true shop supervisor as she connects with the energy of what I am making. Velcro also “helps” me stay up to date on the computer. 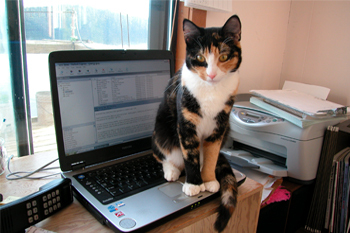 She is a polydactyl cat (has extra toes on her front feet) and those toes come in handy on the keyboard. Carol has been creating architectural glass commissions for almost 20 years. Several years ago, Carol took a break to play with something much smaller…fused pendants. She experimented with melting dichroic glass in her kiln and began wearing her first creations…people admired them, and asked to buy this jewelry. Carol began searching for a name and Serendipity seemed a good fit because of the playful nature of her fusing process, and the unexpected response to her jewelry. Carol’s jewelry studio is tucked away in an inlet in remote Barkley Sound on Vancouver Island’s west coast in British Columbia, Canada. Located away from roads and “off the grid”, electricity for the kilns and her home is provided by an old style water wheel called a pelton wheel. Finished jewelry is packed and taken by speedboat to a remote floating post office. From there the Lady Rose, one of Canada’s few remaining packet freighters, picks up the orders and the jewelry begins its journey to you. From its inception, through manufacture and shipping, jewelry from Serendipity by Carol is indeed unusual and unique. …my pendant, which I love so much and I receive compliments on each time I wear! 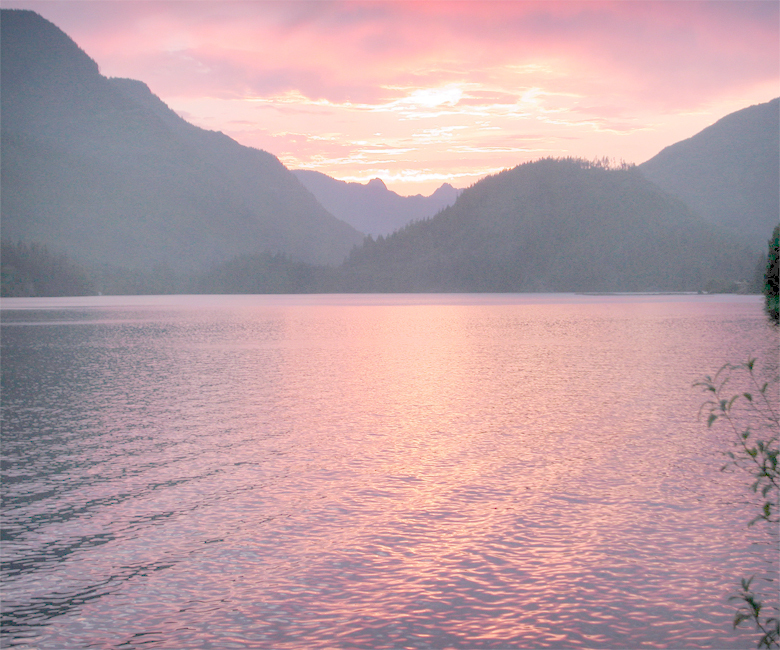 Jax, British Columbia. Just received my pieces today absolutely gorgeous. Patricia, New York. I have been keeping the ashes of three pets for years looking for something like this. Thank you so much for creating pet mementos. Marg, British Columbia. I just wanted to let you know that your necklaces arrived safe and sound yesterday and they are just BEAUTIFUL!!!! The colours are incredible and the silver cords so pretty too!! Thank you so much Carol! I really appreciated the pamphlet about the pet mementos too - I can't think of a better way to carry your precious pet with you always. Hopefully we won't need some for a long time but you never know do you? What a wonderfuland creative idea! your work is absolutely stunning! Thanks again Carol.